Now you'll never lose little Spot in the woods again. 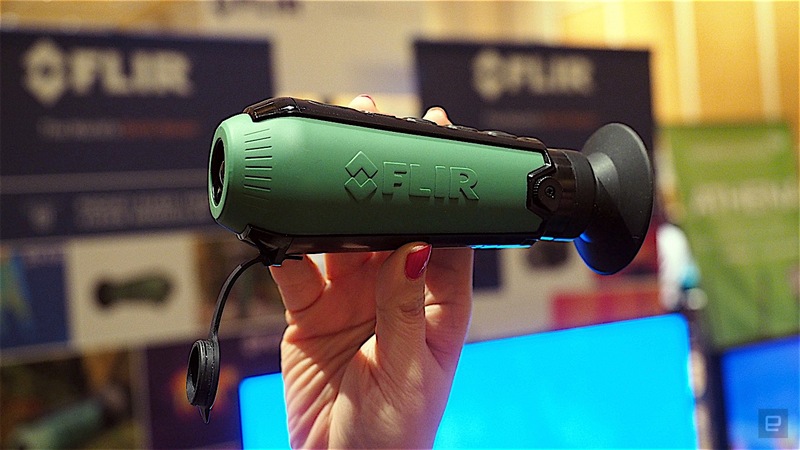 FLIR is a company mostly known for making professional-grade thermal vision cameras or smartphone-connected ones like the FLIR One. At this year's CES, however, FLIR is coming out with something completely different; a compact thermal camera that doesn't need a phone at all. It's called the Scout TK, and it's specifically made for use in the rough and tumble outdoors. The monocular device is able to record both still images and video and it's much more weather-resistant than the One. It does have a narrower field of view, but unlike the One, it has a much longer range of up to 100 yards away. As for battery life, it also has about up to five hours of continuous use. I used it here at CES and found that it worked well enough as it revealed the heatmap of those around me. I was impressed by how lightweight it was too. A FLIR spokesperson said that the Scout TK is really meant for activities like camping, where you can use the camera to spot wild life or look for a missing pet. The Scout TK costs $600, which sounds pricey, but it's actually fairly inexpensive as far as most thermal cameras are concerned. It's expected to go on sale on Flir's website and on Amazon some time this year. Dan Cooper went above and beyond his call of duty to contribute to this report.